Lisa Kayne Lieberman | I Like Tattoos So Why Didn’t I Want My Daughters To Get Them? I Like Tattoos So Why Didn’t I Want My Daughters To Get Them? When my older daughter was 19 and in her sophomore year of college, she started mentioning that she might want to get a tattoo. I didn’t react and hoped that it was a passing whim that she would soon forget about. Well, that didn’t happen. Don’t get me wrong, I like tattoos and I’ve even stopped a few people on the street when I admire their tattoos—their creative expressions. And some tattoos are like paintings and they are gorgeous. But, there was something about my daughter getting a tattoo that bothered me, maybe even upset me. And I needed to figure out what it was. A few weeks later, she called to tell me that she got a tattoo of an acorn on the inside of her wrist. Many of her friends were getting tattoos and she impulsively decided one night to go and get one. She didn’t give a lot of thought to what she wanted the acorn to look like. She had just gone through a painful breakup with her boyfriend and she told me the acorn was a sign of strength—that was more important than the design. My first thought was: “I hope she went to a good place where they used disposable needles, so she doesn’t get an infection.” That’s my “go to” worry—health and safety. It was easier for me to think about that than the fact that she had a permanent image on her body. At first, my daughter loved the tattoo and couldn’t wait for me to see it. However, after a few months, she realized that she didn’t like the way the acorn was drawn. She said it looked “amateurish and clumsy”. So, we started to brainstorm about how she could transform the acorn image into something else. Maybe it needed more detail or shading. I put my feelings about tattoos aside and suggested we scan her wrist and then we could use our Photoshop and design skills (my daughter is an artist and I am a textile designer) to come up with something she would love. That never happened. Instead of redesigning the existing tattoo, she decided she wanted to get another one. This time, my daughter took a lot of time thinking about what she wanted (both the meaning and the visual design) and where she wanted it. She decided on the first hexagram from the I Ching, which symbolizes creative force. 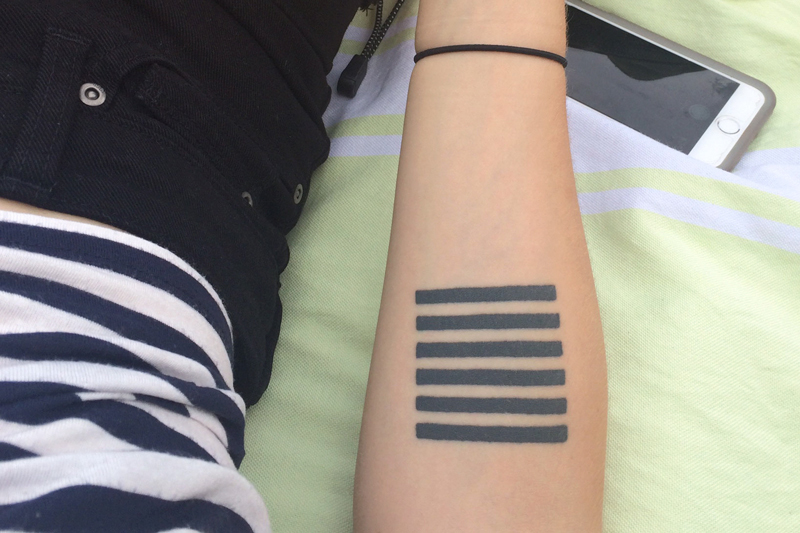 A year later she got another tattoo based on a drawing by the artist Josef Albers. My younger daughter followed soon after. She got her first tattoo when she graduated from high school. Since then, she has gotten about 5 or 6 more. I call them “spot” tattoos. They are smallish, geometric shapes that are placed in visible areas—fingers, upper arm, back of neck—they are like little surprise “jewels”. I really like my daughters’ tattoos but I realized I still had an “issue with them”. I needed to understand WHY? I eventually realized that the idea of “permanence”—having something on your body forever—was what bothered me. What happens if you start to hate the tattoo five years later? If you eventually think it’s ugly or has lost its meaning to you? But you are stuck with it! That’s exactly what happened with my daughter’s acorn tattoo. And it only took a few months for her to stop liking it. Every time one of my daughters gets a new tattoo, I think about the fact that they are adding to a collection of permanent images on their bodies. Even though they may grow to not like the specific images, they are markers and reminders of what they liked and were commemorating at certain times in their life. These can be good or unpleasant reminders/memories. So, why is it bad to have those reminders? My thought was that it might be difficult or painful for my daughters in the future. Every time they looked at the images on their bodies, would they be reminded of difficult or sad times? Would the images remind them of the good times in their lives that are now passed? What I realized is that these are my thoughts, not theirs—about tattoos which are on their bodies, not mine. I needed to separate and allow my daughters to have their own life. However, I wanted to change my thinking about the negative or painful aspects of “reminders” or memories of the past. This is my “issue”. Perhaps, I don’t want to be reminded of certain things in my life. And a tattoo for me would be a reminder that I couldn’t get away from. I now realize and embrace the fact that these images have meaning for my daughters that go beyond the purely visual. And they are not thinking about if they will like the images in 3 years or 30 years. They will deal with their thoughts and feelings about the tattoos in their way. Right now, I am loosening my grip on my thought that reminders of the past might be troubling or painful. They do not have to be. They are a chronicle of one’s life, a history, and I can begin to look at them as just that. By identifying the thought that was bothering me about my daughters’ tattoos, I was able to change my thinking. I embrace the fact that whatever or whenever my daughters choose to add to their “collection” of body art has meaning and relevance for them and that’s all that really matters. I Now Avoid Narcissistic Friends. Here’s How.